Send invitation to guests for a formal party in your house on New Year’s Eve. Make craft stations around your home for the guests to make confetti balloons. Plan a dinner that progresses from one friend’s house to another and finally to your house. New Year’s Eve is not a party time for everyone. 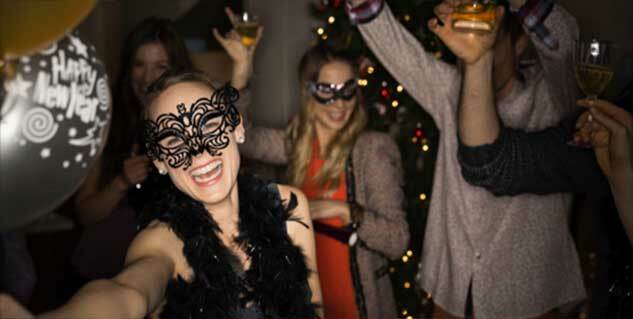 There is, in fact, a larger demography of those who sit at home on New Year’s Eve than what one who regularly goes for parties before the start of a fresh year can imagine. Instead of watching the countdown on telly, why don’t you plan a party for yourself? Here are things you can do to celebrate New Year. Send invitation to guests for a formal party in your house on New Year’s Eve. Your guests might be more interested in being pampered with a grand dinner and wine instead of punch and party hats. Ensure that you let your guests know what dress code to follow for the dinner party. Decorate tables in a sober fashion by covering the tables with a black or white tablecloth with flowers or candles in the center. If you do not want to cook the dinner, have it catered. Make craft stations around your home for the guests to make confetti balloons and noisemakers to be used at midnight. If the guests bring their kids along without a babysitter, make sure to set up kid-friendly craft stations so the parents can make party decorations together. Instead of deciding the entire theme or everything that a guest should do at the party, ask your guests to bring whatever games they have to the party. Having a game night for your guests will ease the pressure of entertainment. Plan a dinner that progresses from one friend’s house to another and finally to your house. For instance, you can start with an appetizer at a friend’s home before moving to main course or dinner at your home. Make sure you reach your home at least an hour before midnight.